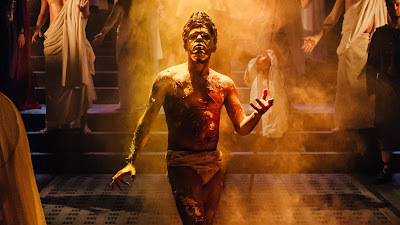 Last Friday night Stuart and I went to see the second, and final, part of the lengthy adaptation of Richard Harris's three epic Cicero biographies Imperium II: Dictator at the Gielgud Theatre in London's glitzy West End. This part was shorter than the first, but at just over three hours, still long. Very long. But we loved it - probably even more than part I. There was thicker politicking, deeper philosophising, higher intrigue, looser morals, more fourth-wall breaking, albeit fewer decapitations, precious few heaving bosoms, and no six-packs. In summary: with Caesar out of the way Cicero, rather like many an aging politician, tried to outwit the new order - the political upstarts. But in their own ways both the headstrong Mark Antony and wily, young Octavian out-foxed our hero with their own mixtures of flattery, guile and sheer brute force. Again the whole cast were again excellent and we hung on their every word.